Voting for the 2018 NFL Pro Bowl has opened across the country and fans of their favorite players or teams can chime in with who they think should be selected to play in the league’s annual all-star game. This January, the AFC and NFC will battle it out with their respective stars aligned in Orlando, a week before the Super Bowl. Here at PFF, we thought it was time to dive into our own data and give you a Pro Bowl Cheat Sheet, looking at who should make their respective rosters for both conferences based upon PFF grades and PFF Elite signature stats. *Editor’s note: This story was originally published on December 7, and all statistics mentioned are up to the culmination of Week 13. The Pro Bowl rosters are announced on the evening of December 19. PFF Elite Stat: Smith sees the league’s highest passer rating on deep passes (20-plus yards in the air) at 130.4, nearly 10.0 points higher than the next. 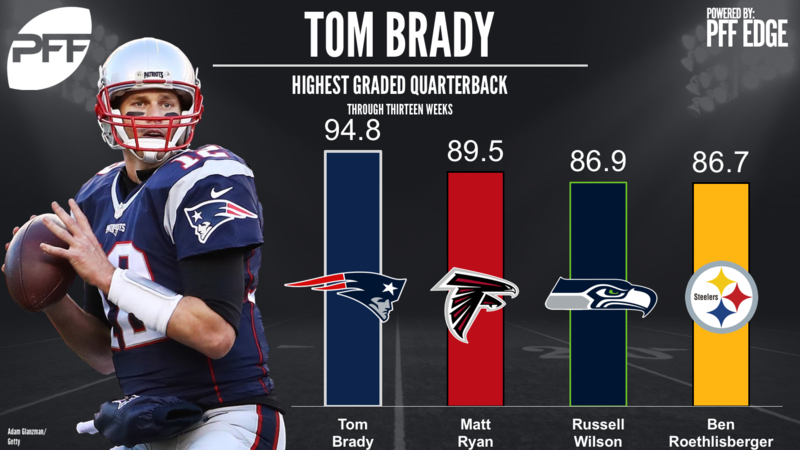 Brady started hot and has never slowed down this season as he still remains the NFL’s best quarterback at the age of 40. It took Ryan four games and bye week to cure his Super Bowl hangover, but the Falcons signal-caller has been playing exceptionally well of late, just has not had the interception luck that helped him in his MVP season in 2017. Wilson and Roethlisberger have both been uncharacteristically inconsistent, but at this point have still played more decent games than mediocre ones. PFF Elite Stat: Hunt has forced 12 more missed tackles on carries than any other NFL running back this season. Even though defenses have done a good job in limiting Hunt recently, he and Lewis have been the most elusive backs in the AFC this season as they have combined to force precisely 100 missed tackles on 359 touches. Kamara has been the best running back in football over the past five weeks and picked up 37 of his 46 forced missed tackles over that time span. Sherman tis the highest graded full back at this point of the season with an 82.1 overall grade. Juszczyk is not as heavily involved in the passing game as he was in Baltimore a season ago, but he has had a couple nice runs and remains one of the best blockers in the game. Juszczyk’s 80.6 run block grade is second to only Sherman’s this season. PFF Elite Stat: The league-leaders in yards per route run among wide receivers goes: Jones (3.19), Brown (2.87), Thielen (2.56), Allen (2.52), Green (2.36). Similarly to previous seasons, Brown and Green has been consistently good this year. However, Allen and Hopkins gained ground on them with some exceptionally productive outings as both players had three-game stretches in which they recorded over 400 cumulative receiving yards. The Falcons failed to get Jones involved as much as they would have preferred early on in 2017, but his 99.9-overall graded performance against Tampa Bay assured everyone that he is still as elite as wide receivers come. Thomas and Baldwin remain their quarterback’s favorite targets on playoff-contending teams while the homegrown Thielen was able to build on his breakout season and has joined the group of top-tier NFL receivers this year. PFF Elite Stat: Gronkowski and Kelce are one and two in yards per route run this season among tight ends, at 2.33 and 2.16, respectively. Kelce, despited a slow down in recent weeks was able to put together a strong performance against the Jets in Week 13. While Gronkowski is having a quiet season by his standards, his elite blocking helps him earn a spot on this team. While their blocking is not on the same level as that of their AFC counterparts, Ertz and Brate have both been among the best red zone targets in the NFL this season. PFF Elite Stat: Bakhtiari leads all the league’s tackles with his 98.5 pass blocking efficiency. Even though he has not been close to perfect in pass protection, Castonzo has been basically the only bright spot on the Colts’ offensive line due to his run blocking. Similarly, Penn has been among the best run blocking tackles in the NFL, while Gilbert has allowed just four pressures all season. There would be a lot more people would be talking about Daryl Williams’ breakout season if he played at a skill position as he has not allowed a single sack over the last six games. PFF Elite Stat: Martin is tied for second among the league’s guards with his 98.0 pass blocking efficiency. DeCastro has been the best run blocking guard this season and in addition, he also has not allowed a single sack or hit to date. While he still has his occasional struggles in pass protection, Mason has become one of the more consistent run blocking guards in the NFL. Furthermore, Martin is having a terrific season as he did not allow a single pressure in six of his first seven games in 2017. Although Scherff missed some time with injury, he has made the best of his opportunities to show that he has taken another step forward and has become consistent both in pass protection and run blocking. PFF Elite Stat: Hudson hasn’t allowed a QB sack in a regular season game since 2015, and leads the league’s centers with his ridiculous 99.8 pass blocking efficiency this season. It’s the usual suspects in the NFC as neither Mack nor Frederick has allowed a sack this season and Kelce has taken his run blocking to new levels and therefore has become the best run blocking center in the NFL. On the other hand, Hudson is the best pass blocking center in the league as he has allowed a total of one pressure so far in 2017. Finally, New England center David Andrews came basically from nowhere to stand out with his exceptional run blocking over the first three quarters of the season. PFF Elite Stat: Ingram and Bosa rank one and two, respectively with their 61 and 60 total QB pressures so far this season, among 4-3 defensive ends. Many might have been skeptical about Campbell signing with the Jaguars, but he has been a difference-maker in Jacksonville and already has more sacks than had in a single season in Arizona. Meanwhile, over on the west coast, Bosa and Ingram form the best edge rusher duo in football as they have combined to record 121 total pressures – including 21 sacks – in 12 games this season. Jordan should finally get the recognition he deserves with a solid defense around him and he’s also having his best run stopping season to date. It was only a matter of time before Graham finally had a season with 10 or more sacks based on the number of pressures he generates every season. And finally, even though Lawrence had a mid-season slump, he’s back to his early-season form as he has had a sack in nine of his 12 games. PFF Elite Stat: Donald has 51 QB hurries alone, which would rank him third among the league’s interior defenders alone in total pressures. He leads the league at any position with 70 total QB pressures. Similarly to Cameron Jordan, Donald may finally get the recognition he deserves since his team might play late into January. Suh has been quietly the most consistent interior defender over the last five seasons as he was among the best at his position in every season in that time span. While Harrison has recorded just one sack this year, he is having his best pass-rushing season to date, meanwhile McCoy seems to be back to his old self after a couple quiet seasons. PFF Elite Stat: Miller’s 14.7 pass-rush productivity is the highest among all the NFL’s 3-4 outside linebackers. Miller and Mack have been the best edge rushers of the decade and they still set the standard for the position even though Mack has not been able to replicate his pass-rushing numbers from the past two seasons. Seemingly no one is talking about him, but Sheard has been an excellent signing for Indianapolis and is having the best season of his career. Matthews was able to turn around his downhill slide of the past two seasons and is putting together his best season in run defense while remaining effective as a pass-rusher. PFF Elite Stat: Wagner is the only inside linebacker to rank in the top 10 of both run stop percentage and pass-rush productivity, as he ranks fourth and third in each facet, respectively. Smith and Shazier are both playing with a similar style as they make plenty of big plays, but miss a handful of tackles as well. However, the comparisons do not stop there since both players appear make a leap in 2017 and turn into a player that many anticipated they would become. David would make the team on the AFC side, but Wagner and Kuechly are once again the two best linebackers in the league as Wagner is playing at an incredibly high level in the absence of couple of the other leaders of the Seattle defense. PFF Elite Stat: Bouye fields the league’s lowest passer rating when targeted (38.0), among cornerbacks with at least 124 snaps in coverage. It’s incredibly hard for rookie cornerbacks to come into the league and play well from the get go, but White and Lattimore have both been a big part of their teams having a legitimate shot at reaching the playoffs. 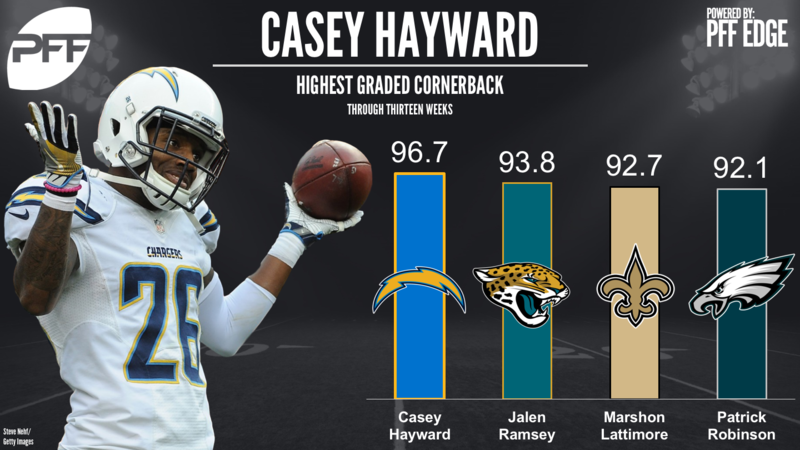 Hayward has been probably the biggest steal in football for the second consecutive season as he is playing at a very high level on a team-friendly contract for the Chargers. The Jaguars’ young cornerback duo has turned out to be the best one in the NFL already in their first year together. The Eagles tried to strengthen their secondary through the draft and trade as well, but, surprisingly, free agent acquisition Robinson has been not only their best cornerback, but also one of the best in the entire league. PFF Elite Stat: Byard leads the league’s safeties with six interceptions, while Addae has seen 57 targets without allowing a touchdown in coverage, the most targets without a TD in the league. There has been a changing of the guard at the top tier of NFL safeties in 2017 as Byard, Amos and Joyner have all taken a significant step forward in becoming household names this season. Meanwhile Addae and Gipson have both been able to take advantage of very good play around them on their defenses. Finally, Smith should be in contention for the Defensive Player of the Year award as he is having a career season, which says a lot based on his impressive track record in the NFL. Kern leads the league with an average of 45.4 net yards per punt while Morstead saw 51.2 percent of his punts land inside the 20, which is the second-highest rate in the NFL. While Tucker has not been as effective as in previous seasons from outside the 50, he has missed only one field goal attempt inside the 50. Zuerlein leads the NFL with 36 successful field goal attempts this season, including six from over 50 yards. Cooper is third in the NFL in average kickoff return yards (28.7) and punt return yards (12.6) as well while Jackson has been electric on punt and kickoff returns as well. Baker leads the NFL with 12 tackles on special teams while Michael Thomas continues to play an important part on all four core special teams units and remains one of the best vices in the game. Weeks and Nelson have yet to have an inaccurate snap on their 225 combined long snaps this season.